Published March 26, 2010 at 250 × 344 in Art. This piece was inspired by the scripture passage of Matthew 7:24-27. Jesus teaches a parable of two houses, one with a foundation of rock and the other with a foundation of sand. Of course, when the storms came it was the house built on the rock that stood. I believe Jesus was using this as a reference to our lives. If we live our lives in relationship with Jesus, hearing and following His word, He will sustain us in difficult times, lead and guide us. 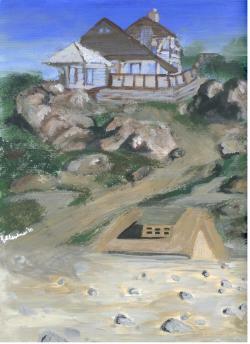 I have added something in this painting that is not spoken of in the parable and that is a path between the two houses. I believe that even if a person is currently in a place where they do not know Jesus and their life’s foundation, then, is built on sand, they have the choice to change by surrendering control of their life to Jesus and making Him the strong foundation of their life, just like the rock pictured here. Jesus is very patient and He longs for all to come to the saving knowledge of Him. If you are reading this, and you don’t know Jesus as your Saviour, ask Him to reveal HImself to you and to show you His love and grace so that you too can expereience this strong foundation of having Jesus Christ in control of your life. God Bless you!